$4/DZ FAKE WINNING LOTTO TICKETS. 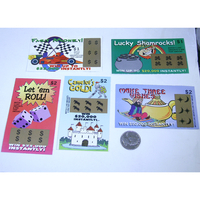 AFTER YOU SCRATCH OFF THE HIDDEN NUMBERS YOU ARE A WINNER TILL YOU READ THE BACK INSTRUCTIONS ON HOW TO GET YOUR MONEY. BASICALLY SAYS CLAIM FORMS SUPPLIED BY SANTA CLAUSE , AND ALL WINNING TICKETS MUST BE VALIDATED BY THE TOOTH FAIRY. THESE ARE FOR ENTERTAINMENT ONLY.